CFS/ME (Chronic Fatigue Syndrome/Myalgic Encephalopathy) is a devastating, debilitating illness. It is not one single entity. Currently there are about one million people with CFS/ME in the United States. 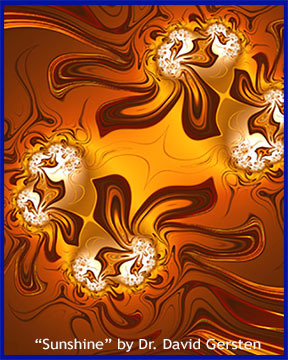 The fractal graphic "Sunshine," which I created, is the opposite of how most people with CFS/ME feel. 3. Absence of another medical illness that could explain the wide array of symptoms, such as hypothyroidism. Because CFS/ME symptoms are so serious, you must rule out cancer, Lyme disease, bowel disease, lupus (SLE), anemia, or AIDS. Not every person with chronic fatigue meets all criteria for CFS/ME. Most have cognitive impairments, which include impaired concentration, impaired memory, and indecision, along with a host of painful moods including anxiety, depression, excessive worry, and fear. Patients with CFS/ME know how frustrating it is to live with an illness that makes many people, including doctors, roll their eyes as if to say, “You're just depressed.” This disease won't go away by taking Paxil. 1. Severe fatigue after exercise. 2. Neuro-cognitive deficits, such as: poor memory, impaired concentration, dizziness, blurry vision, tremor, and anxiety. There are a host of other debilitating symptoms including: sore throat, tender lymph nodes, joint swelling, headaches, intolerance to heat or cold, allergy, insomnia, and digestive problems. If you are close to someone with CFS/ME, understanding what he or she is experiencing can mean a great deal to them. Imagine the worst case of the flu you ever had. Now imagine that it never goes away. Now imagine that no one believes you. That's what the person you know is going through every day. Let’s take a quick look at the Health Map (see above link) in regards to CFS/ME. Level I of the Health Map involves Primary Causes. Some primary causes involved with CFS/ME are toxicity, infection (viruses, bacteria, yeast, parasites, and mycoplasma), intestinal dysbiosis, malabsorption, protein deficiency, genetics, and the “stress factor.” In my many years of treating CFS/ME, I have concluded that are never fewer than 7 primary causes. Level II— How the Body Responds to Primary Causes. This is where the action starts. The body responds to all primary causes through inflammation and the stress response. In CFS/ME there are numerous problems with biochemistry. The body is two-thirds water. By dry weight, we are about 65% amino acids, so amino acids are critical nutrients involved in most chronic illness. I’m referring to the Health Map because it is important to understand the mechanisms of chronic illness, the cause-and-effect cascade of biochemical problems.” What you are reading applies to almost all chronic illness with the exception of structural issues, which are best served by a chiropractor, orthopedic surgeon, or massage therapist. Iso-leucine, leucine, and valine (the branched-chain amino acids) are often deficient in CFS/ME. These amino acids are involved with muscle chemistry, and their deficiency can lead to muscle wasting, muscle weakness, and fatigue. Brain chemistry is usually impaired in CFS/ME, especially norepinephrine (involved in mood and cognition), serotonin (involved with mood, sleep, and a sense of wellness), and dopamine (involved with motivation, pleasure-reward, and depression). The amino acid L-tyrosine is the precursor to norepinephrine and is often deficient. The amino acid L-tryptophan is the precursor to serotonin and is often deficient. The amino acids L-tyrosine and L-phenylalanine are the precursors to dopamine, which is also frequently deficient. If a person is protein deficient, many of the essential amino acids are likely to be deficient. The sulfur-bearing amino acids L-cysteine, L-methionine, and taurine) are involved in detoxification, and one or more are often deficient. L-cysteine is a major precursor to glutathione (a tripeptide made of cysteine, glycine, and glutamic acid). Wherever there is a molecule of toxicity, glutathione arrives to detoxify that toxin. As the toxic burden increases, glutathione starts to get used up. As a glutathione deficiency increases, a person can become hypersensitive to perfumes, cologne, detergents, and gasoline fumes (to name a few). As this deficiency increases, often accompanied by a methylation pathway problem, a person can become ultra sensitive to medications and even nutritional supplements. This is known as MCS (multiple chemical sensitivity). Glutathione (GSH) has numerous important functions: 1) master detoxifier, 2) one of 5 core anti-oxidants, 3) essential cofactor for energy chemistry (the Krebs Cycle), 4) protects DNA from damaging effects of UV radiation when cells duplicate. Glutathione is almost always deficient in CFS/ME. Over the last 15 years a problem related to GSH has grown in our awareness, and that has to do with the “methylation pathway.” Methylation is a pathway involved in the production of GSH. When there is a methylation blockade, the body has a difficult time making GSH. When there is a significant methylation blockade, treating methylation becomes the number one issue. Digestive problems may affect 75% of the American population. They certainly affect at least 75% of people with CFS/ME. Dysbiosis (imbalance of gut bacteria) is common. Parasites are common. Yeast (candida) overgrowth is common. Chronic infection and inflammation can lead to leaky gut syndrome, and that can lead to systemic candida and delayed (IgG) food allergies. It has been my clinical experience that a powerful, scientifically-determined amino acid therapy approach dramatically improves the health of at least 75% of people suffering with CFS/ME. With that said, all nutrients have to be addressed, from macro nutrients (protein, carbohydrates, and fatty acids) to micro nutrients (vitamins and minerals). We can dispel the common idea that there are no lab tests that are abnormal in people with CFS/ME. While conventional lab tests, such as a basic metabolic panel, will be normal, amino acid testing consistently reveals something quite different. An amino acid blood test evaluates 45 amino acids. With CFS/ME 15 to 20 of those 45 sub-tests are usually abnormal. The fact is that when you use amino acid therapy correctly in CFS/ME, the clinical response is often remarkable. However, there is no formula. Each person is different and amino acid deficiencies, while showing similarities, will vary from person to person. Many infectious agents are linked to CFS/ME, including Epstein-Barr virus, Cytomegalovirus, and HHV6. These are all in the herpes family. When one herpes virus gets activated, all herpes viruses can become activated. Mycoplasma, which is similar to a bacterium, is found in two-thirds of CFS patients. Parasites are also implicated. It would take hundreds of pages to describe the kinds of diagnostic tests that help pinpoint the primary causes of CFS/ME in each person. Remember, there are never fewer than 7 primary causes in chronic illness. We are getting closer to understanding the “energy blockade,” the biochemical disaster taking place in the mitochondria, the energy factories “on strike” within the cells of exhausted people. There appear to be multiple biochemical pathways where energy blockades occur. The energy collapse is the “final common pathway,” the end result of a virus, mycoplasma, chemical toxin, inflammation, or extreme emotional stress. People who have been ill for years with CFS/ME can begin to recover once proper testing and treatment have begun. The longer you've been ill, the longer it will take to recover. People who have been ill for less than a year can often regain their health within months. Those who have suffered longer should keep the faith. With persistence and the right help they too can become strong again. While there are certain amino acid deficiencies often seen in CFS/ME, it is important to appreciate the great complexity of this disease. Here is one thing I’ve seen over the course of the history of this problem. Many intelligent clinicians and researchers have focused on one piece of the puzzle, without paying attention to other pieces that make up the whole. We all owe a debt to Rich Van Konynenburg, whom I first met on a CFS/ME Internet discussion group. Rich didn’t have any agenda, and was terrific at looking at all laboratory problems, symptoms, and treatments… and then helping us understand those various aspects, thereby developing a coherent diagram of how CFS/ME often unfolds. Amino acid therapy has been a mainstay of my approach, but as always, I treat the “person” who has CFS/ME, so I will look at every aspect of a person’s life as part of my evaluation. Do you know what supplements you really should be taking? Have your doctors told you there is nothing wrong? Nutritional/metabolic lab testing is ALWAYS abnormal in chronic health conditions. Dr. Gersten has treated CFS/ME for 30 years and works through lab work, not guess work. He is nationally-recognized in holistic medicine because he is able to look at great complexity, analyze the data in the light of your symptoms...and the total YOU, and make sense of the lab data in a way that you can understand. He then makes recommendations based on lab work and decades of experience that leads to powerful healing. AMINOACIDPOWER.COM, created by Dr. Gersten, is one of the largest amino acid sites on the Internet. Its section on chronic fatigue syndrome is extensive, so please feel free to click on the link above and check it out.